Alfred Lynn Hultzapple was born 21 Apr 1925 in Marysville, Pennsylvania. He was the youngest child, and only son of Alfred and Matilda C. Leinaweaver Hultzapple. Alfred had four sisters, Dorothy Hultzapple Castle, Catherine V. Hultzapple Kauffman, Martha F. Hultzapple Hamilton, and Jean H. Hultzapple Squibb. His father died just three months after Alfred was born. The family lived in Perry County with Alfred’s maternal grandparents, J. McClellan and Maggie J. Leinaweaver, and later with his maternal uncle, John B. Lienaweaver. Sometime after his enlistment, his mother moved to Harrisburg, PA. When Alfred enlisted on 25 Jun 1943, he had just completed his Junior year at Newport High School. He trained at Camp Croft, SC, Fort Meade, MD, and Camp Kilmer, NJ before being sent overseas in February, 1944. Pvt. 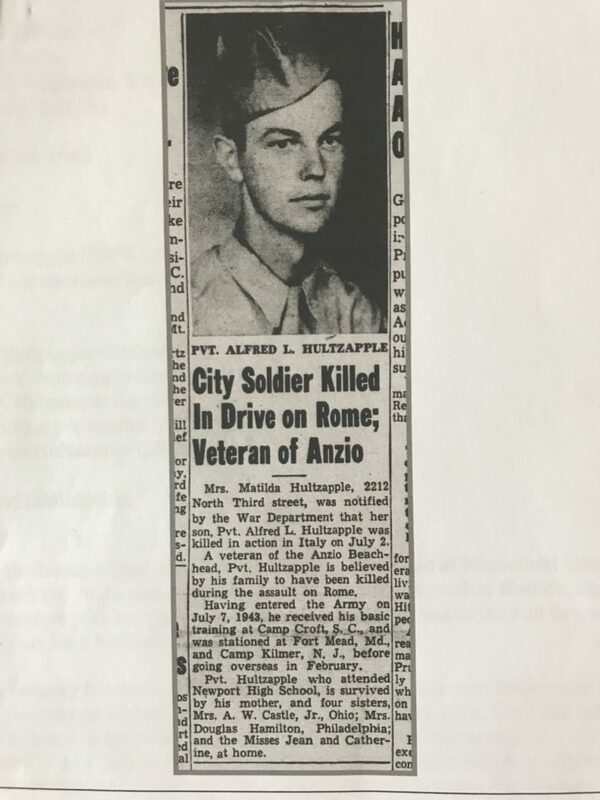 Hultzapple served in Italy during WWII as a member of the 30th Infantry Regiment, 3d Infantry Division where he served in combat at the Anzio Beachhead and the march toward Rome. The 30th Infantry Regiment quickly moved through the German defenses to the west of Cisterna and moved on to capture Cori on 25 May 1944. The 30th Infantry continued on and in the next couple of days had captured the towns of Roccamassima and Giulianello. By 3 June, the 30th Infantry had moved forward in the center leading the way to capture other towns of Lariano, Valmontone, and Cava. Alfred L. Hultzapple was killed when the regiment was between Giulianello and Lariano. 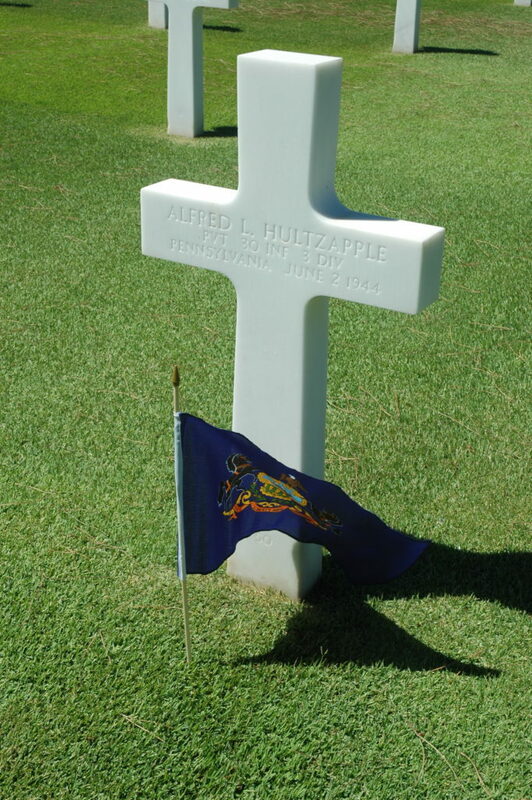 Alfred L. Hultzapple is buried in Nettuno, Italy at the Sicily-Rome American Military Cemetery, Plot E Row 7 Grave 50. 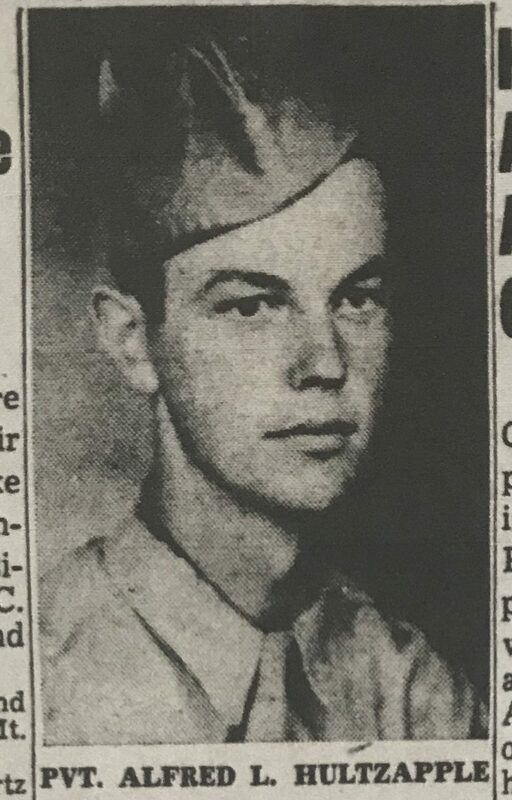 We are grateful to Private Hultzapple for giving his life in the defense of our nation.